Fleer Trading Cards has been known for aligning themselves with athletes in a class above the rest. This trend continues with Fleer's latest signing of Charles Barkley, one of the 50 top NBA players of all time. Fleer and Barkley have signed a deal that will feature Barkley throughout Fleer's NBA brands, including Greats of the Game NBA, Fleer's highly anticipated all-retired player basketball set. Fleer also has exclusive packaging rights for Barkley and will be using him for Greats of the Game packaging. "Signing Charles Barkley is a monumental moment for Fleer and our entire line of NBA trading cards," said Fleer spokesman Joshua Perlman. "The inclusion of Sir Charles in our brands, along with his autographs, will definitely heighten the overall collectibility of our NBA sets." As one of the greatest 50 NBA players of all time, Charles Barkley was an 11-time NBA All-Star, the 1993 NBA Most Valuable Player, and one of four players in history to amass at least 20,000 points, 10,000 rebounds and 4,000 assists throughout their career. Barkley's successful career has continued off the court as a leading broadcaster on Turner Sports' Emmy Award Winning "Inside the NBA," one of the most watched sports programs in the country. Already a best selling author, his new book, "Who's Afraid of a Large Black Man?" will be released in March. 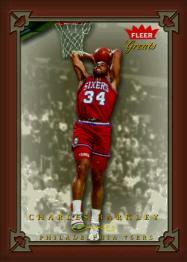 A press conference with Fleer and "Sir Charles" will kick things off in the Philadelphia area. Barkley will speak on behalf of Fleer and the deal will officially begin. Details to come. "We plan on utilizing Charles in the best way possible for fans and collectors," said Perlman. "This is the first time any trading card company has signed a deal like this with him, and we are honored to have him on our team." Fleer Trading Cards, based in Mt. Laurel, N.J., is a privately owned company and currently produces licensed trading cards for the NBA, MLB, MLBPA, NFL, NFLPA and Freemantle Media. Fleer also produces licensed die-cast vehicles for the NFL, NFLPA, MLB, MLBPA, NBA, NHL, the Collegiate Licensing Company and Zamboni.